Clicking on the smaller images shown in this post will open them, with footnotes, at full size in a lightbox. From early 1994 onward through late 2014, my home in a quiet, wooded neighborhood in the once aptly-named Vista Hermosa area of Guatemala City, Guatemala was where I began an informal apprenticeship on how to grow delicate tropical plants under the challenging conditions that outdoors cultivation can pose anywhere. During this 20-year time span, my tastes in exotic plants changed quite a bit and my collecting goals as well but, beginning in 1998 I eventually settled on a select number of families that I intended to focus on for the long-term. Despite my permanent departure from Guatemala in late 2014 and the breakup of this painstakingly-assembled tropical plant collection that exceeded 1,500 species and hybrids at its peak (including those greenhoused offsite at a friend’s commercial orchid nursery), I still retain interest in and grow significant numbers of several the core groups in California that I grew in Guatemala (i.e. orchids, small palms, aroids, stem succulents, etc.). “Cusucos” are what some rural folks in northern Latin America call nine-banded armadillos (Dasypus novemcinctus), together with the more widely-used “armado”. My wife jokingly baptized this house as, “La Casa de los Cususcos” early on since we had an assortment of strange-looking but friendly small critters trucking around it – inside and out - for the duration. Having patiently put up with living alongside standoffish and often dangerous captive wildlife for our entire time married prior to this move, personable small dogs were very much a novelty in our household, so the “cusucos” they became and the “cusucos” they remained. The house was a bit run down when we got it but had great bones and a wonderful location. Over the first year we managed to sort out the interior and I began to rogue out all the plants that I disliked in the front and rear gardens (i.e. everything). One of the huge attractions of this property was that it abutted what is known as the Barranco de Vista Hermosa, which is a deep, meandering and mostly wooded ravine that runs around the southeastern part of the city. Given that the house was located at about 5,000’/1,550 m elevation, the remnant vegetation was lower montane, seasonally dry cloud forest-associated. While there was an existing short chain-link fence dividing the back garden from the ravine, we decided to beef up the security in the back and installed several layers of locally “de rigueur” razor ribbon and motion sensors to at least give would-be housebreakers second thoughts before tackling an entry via the back yard. During the first decade we lived there, I also planted a swath about 60’/18 m wide with a variety of decorative native plants and trees, including wild plantains (Heliconia collinsiana and H. latispatha), bamboo palms (Chamaedorea costaricana, and C. tepejilote), birds-nest anthuriums (Anthurium salvinii and A. parvispathum), two spiral ginger species (Costus spp. 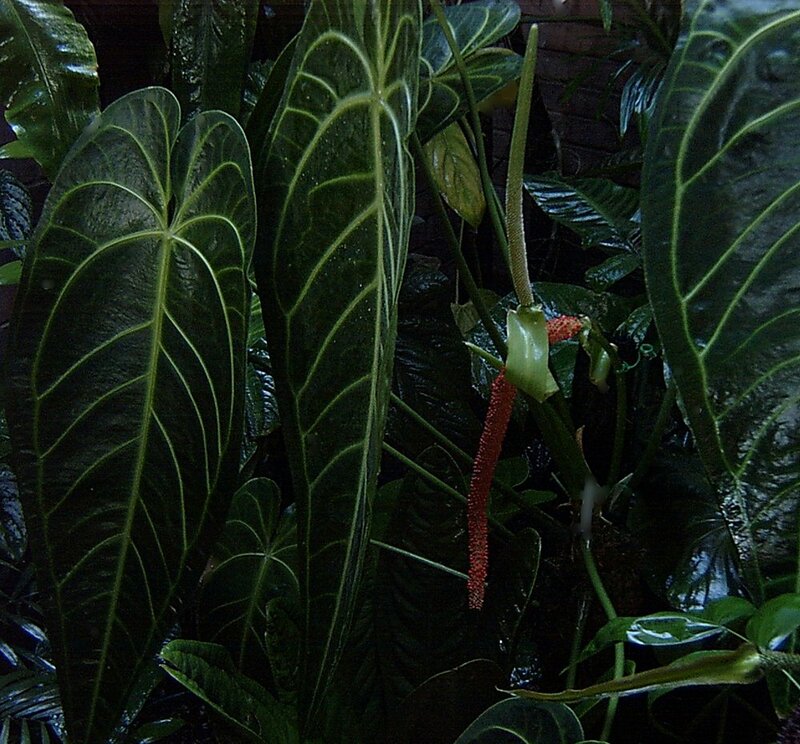 ), a calathea (Calathea verapax) and a seed-grown Devil’s hand tree (Chiranthodendron pentadactylon). Existing secondary vegetation included a large, very showy-flowered daisy tree (Montanoa guatemalensis), Quequisque/elephant ears (Xanthosoma sagittifolium), an indeterminate but shapely arborescent Euphorbiaceae of some kind whose fruit was wildly attractive to birds, several oak species (Quercus spp.) and wild avocados (Persea donnell-smithii). Local wildlife was abundant at first, but as the years passed and the urban footprint in the area expanded, fewer small mammals and “rare” cloud forest birds visited the garden. Noteworthy early mammalian visitors included Central American cacomistles (Bassaricyon sumichrastii), long-tailed weasels (Mustela frenata), Jamaican fruit bats (Artibeus jamaicensis) and long-tongued bats (Glossophaga spp.). The bats, as well as suburban-adapted black-eared opposums (Didelphis marsupialis) and Deppei’s squirrels (Sciurus deppei) lingered ‘til the end. Bird populations ebbed and flowed depending on the time of year, but during the dry season there were always several species of migrant wood-warblers (Parulidae), orioles (Icteridae) and tanagers (Thraupidae) exploring the garden in the early morning and evening. Resident thushes that were commonly observed - and whose nesting activities made ornamental moss-gardening a near impossibility - were clay-colored and rufous-collared robins (Turdus grayi and T. rufitorques). Frequent early morning and late afternoon visitors were eight species of hummingbirds, including almost daily visits by spectacular male violet saberwings (Campylopterus hemileucurus) and diminutive white-eared hummingbirds (Basellina leucotis). Mountain trogons (Trogon mexicanus) and squirrel cuckoos (Piaya cayana) were seen with some regularity in the canopy in and adjacent to the garden. Memorable one-offs over the years included visits by a crested owl (Lophostrix cristata - calling over my front yard late one night), an unspotted saw-whet owl (Aegolius ridgwayi), a collared forest falcon (Micrastes semitorquatus) and a pair of emerald toucanets (Alacorhynchus prasinus). We had a resident, multi-generation family of band-backed wrens (Campylorhynchus zonatus) that had their nocturnal nest about 30’/9 m up on a branch in the giant Mexican cypress (Cupressus lusitanica) that dominated the back garden. These bold and vociferous birds were mostly wonderful neighbors for two decades but did show a magpie-like tendency to “borrow” any small object left on a table and that had caught their eye to decorate their breadbox-sized home. The climate in the central Guatemalan highlands is usually mild, with a dry season that begins in early November and ends in early May, and a rainy season that is markedly bimodal, with peaks in June (usually the wettest month) and September. Total precipitation averages ~54”/1,400 mm annually. The dry season is generally clear and cool/cold during December and January, and temperatures may occasionally dip into the high 30s F/3-4 C in some areas during the predawn hours. From mid February through late April days are mostly warm, sunny and dry. During much of the year the temperatures tend to range between the low 50s to mid-80s F/ 11-30 C so with supplemental water applied during the dry season, these are very favorable conditions for growing plant species from the world’s cloud forests out of doors. My and other local growers' experiences trialing some notoriously delicate lowland rainforest plant species, such as the Malaysian lipstick palm (Cyrtostachys renda) and other heat-loving prima donnas indicates that winter temperatures are too cool for these hyper-tropical species to succeed without overhead protection. After removing the locally omnipresent spot plantings of orange-flowered birds of paradise (Strelitzia reginae), golden butterfly palms (Dypsis lutescens), dracaenas and “eugenias” (in reality a Syzygium sp. ), I reworked all the existing beds and wall edges to remove stray bits of concrete, rebar, brick and glass that are always left behind at local construction sites. I then incorporated large amounts of horticultural-grade pumice and well-composted oak leaf litter to a depth of 18”/45 cm to amend the very heavy clay soil that is characteristic of Guatemala’s Central Plateau. What was ostensibly a “lawn” front and back was a mangy-looking, weed-infested mess, so I dug it out and had large St. Augustine grass sods installed in both areas. Beside the two 12’/4 m beanpole Syzygium sp., there were three large trees on the property that were not removed but were aggressively trimmed to minimize unwanted branch losses down the road. This action proved to be invaluable over the next 15 years as major weather events stressed these trees to the limit. These included a large smooth-bark pine (Pinus pseudostrobus) on the street, a medium-sized fruiting loquat (Eriobotrya japonica) sited behind the glassed-in study at the back of the house, and the previously mentioned Mexican cypress in the center of the rear garden near the rear fence. The dreadful pine tree mercifully succumbed to boring beetle infestation relatively early in our stay but was still big enough to require a several hundred-dollar removal fee. I had the arborist leave the trunk, flat-topped at about 4’/1.25 m tall since I thought it might prove a useful feature down the road (it was - see below). Luckily for me, all my photographs taken prior to 2002 were on print or slide film, so I have the luxury of glossing over the first years of trial and error with the garden and jump straight into the “right stuff”, with the images provided here. A summary of my early failed experiments included setting up a mass planting of several dozen specimen-sized, red-spathed hybrid anthuriums (A. andraeanum-types) on tree fern totems in the atrium besides the front entrance. While showy in flower, the clone I selected from the cut flower trade proved particularly susceptible to aroid blight (Xanthomonas campestris pv. diefenbachiae) and gave up the ghost after three or four years. 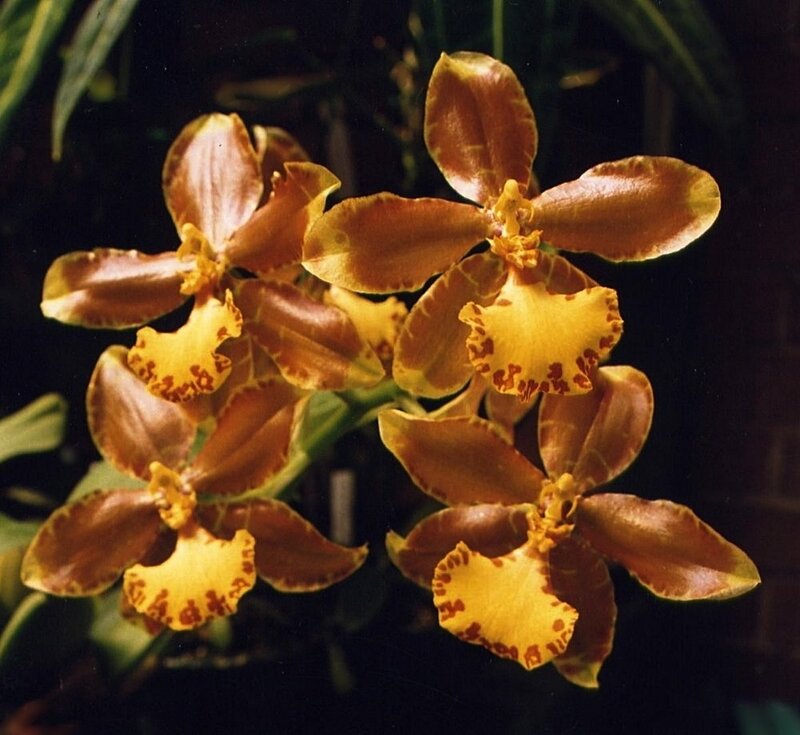 I began to collect cattleya orchid species around the same time, so overhead at first, I had a collection of mostly mediocre examples of potted cattleyas hanging from the wrought iron false ceiling. I had also decided on large bed plantings of a couple dozen same sized rosettes of the albomarginated form of Agave vivipara (= A. angustifolia) along the bases of the rear walls, which admittedly look very handsome staged against white stucco, but are a GIGANTIC pain in the (select any body part you favor) to work around and remove. And remove them I did, in 1998. Because of my interest in ornamental epiphytes, extensive experimentation with plantings the garden's upper spaces began in 1997. Modesty aside, I suspect that I beat the contemporary global “vertical garden” craze that was started by Patric Blanc by almost a decade. Sobralia orchids always had space dedicate to them in this garden, both as native bedding plants (Sobralia decora and S. xantholeuca) as well as potted specimens of many showy-flowered exotic species, mostly Panamanian. 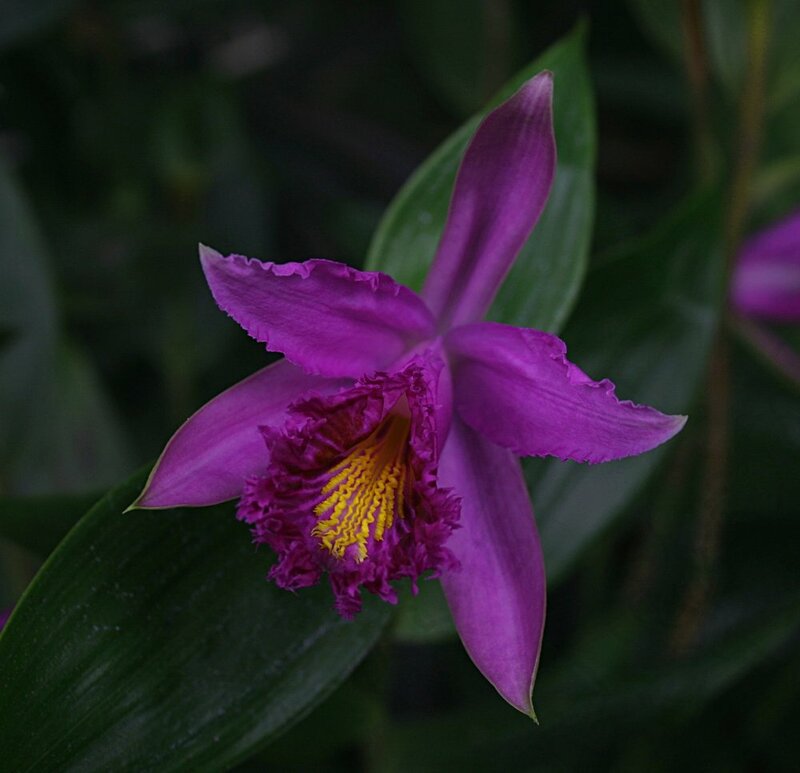 Their bamboo-like foliage and showy, cattleya-like flowers make them excellent accents to site amongst other foliage types. Many species from upper elevation habitats are quite cold tolerant, and I have had several of them survive 30-degree F/-2C overnight temperatures in California, fully exposed to the sky, with little visible damage. The house also had a large, fully-exposed, reinforced concrete terrace (roofing a large carport) that was accessed via a door from the second story master bedroom. Since I already had a decent-sized cactus and succulent collection when we moved into the house, this is where it was relocated to. 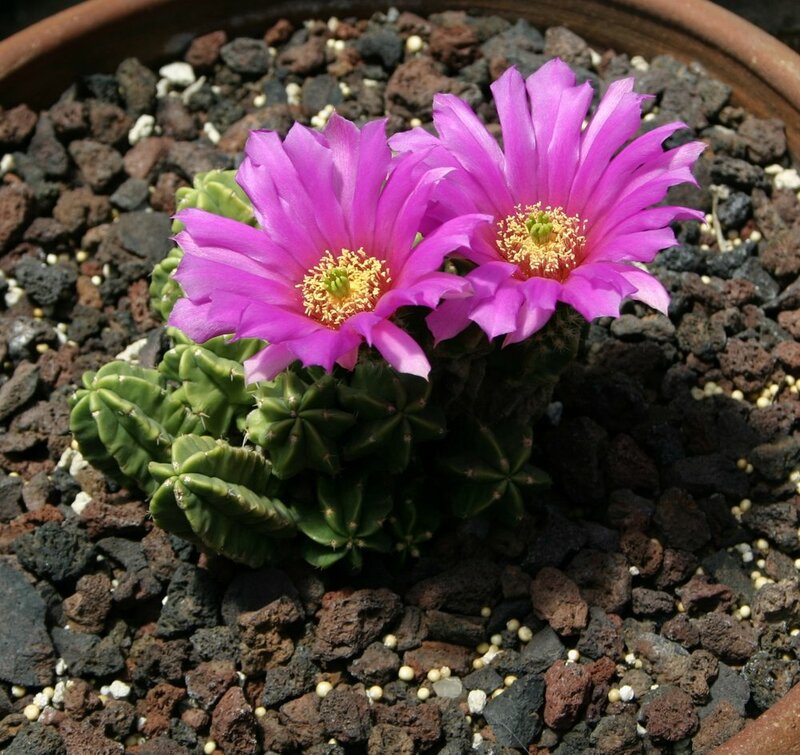 Unfortunately, many of my potted exotic cacti had been pampered at previous residences and were unable to make the transition to blazing sunlight/torrential rain that living there involved. Natural selection winnowed the collection down to a few columnar survivors (shown here in later life), that were subsequently augmented by a representative collection of uncommon native and Mexican agaves and smaller, showy-flowered cacti. 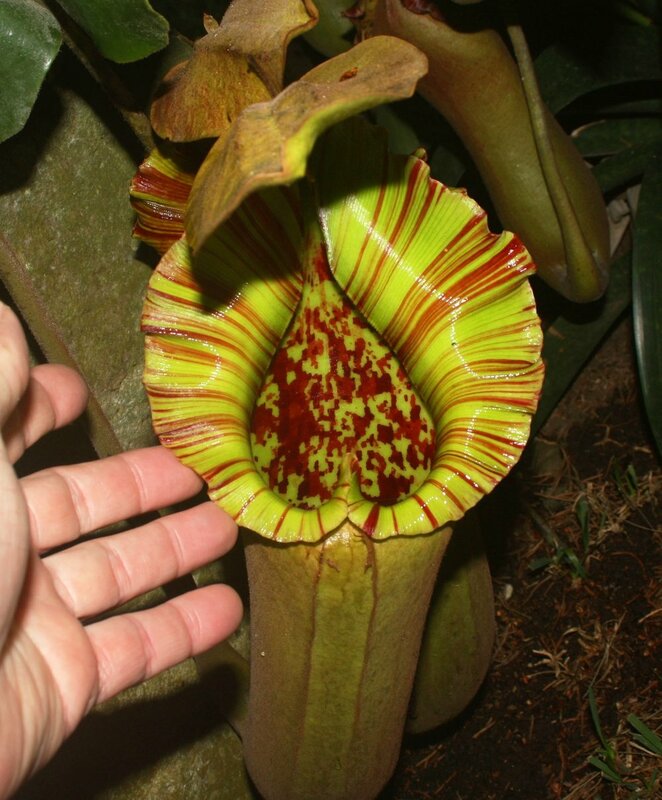 By 1997 I had begun experimenting with growing tropical pitcher plants (Nepenthes spp.) and Mesoamerican butterworts (Pinguicula spp.) outdoors. The results were mostly gratifying, although I had not yet figured out the best substrates for them and tended to grow everything lightly-shaded, as opposed to fully exposed to morning sunshine, which is the regimen I ultimately adopted. The trees in back garden proved invaluable for staging hanging plants, with nepenthes and orchids handing on the lower branches of the loquat, and my collection of >half a dozen specimen-sized Queen of the Night epiphytic cacti (Selenicereus spp.) suspended in large wooden baskets from the lower cypress branches. In 1997 I also began to collect noteworthy tropical aroid species from Central America and elsewhere in the Neotropics. I soon found that sitting the pots on the ground on the back patio was an unsatisfactory way to stage them, so I installed some garden shelving on the wall under the loquat. The constant watering also was making this corner of the garden a muddy mess, so I brought in several dozen (extremely heavy!) bags of foundation rock that I spread around under the tree’s drip zone. In 2003, the constant traffic in the back garden was making it well-nigh impossible to keep a decent expanse of lawn going, so, together with my part-time gardener, I installed 40 stone pavers measuring 18”/45 cm square throughout the back from the patio deck to the rear fence. Being overly creative one long weekend, I decided to use a drill and a Dremel grinder and carve out small therapod footprints in the first several pavers to give the impression of tiny fossilized “dino” footprints leading back into the garden. Unfortunately, my subtle realism was such that, over more than a decade, not a single visitor ever noticed them underfoot. To add some additional visual interest to the rear garden, 10 antique stone bases were installed at varying depths around the space. These bases are salvaged from old homes and farm houses in the central highlands, and usually support carved hardwood columns. They make for superb plant supports but are now rather hard to find and costly in Guatemala. Their great weight and export restrictions on antiques precluded them coming with me to California (see final images after removal). 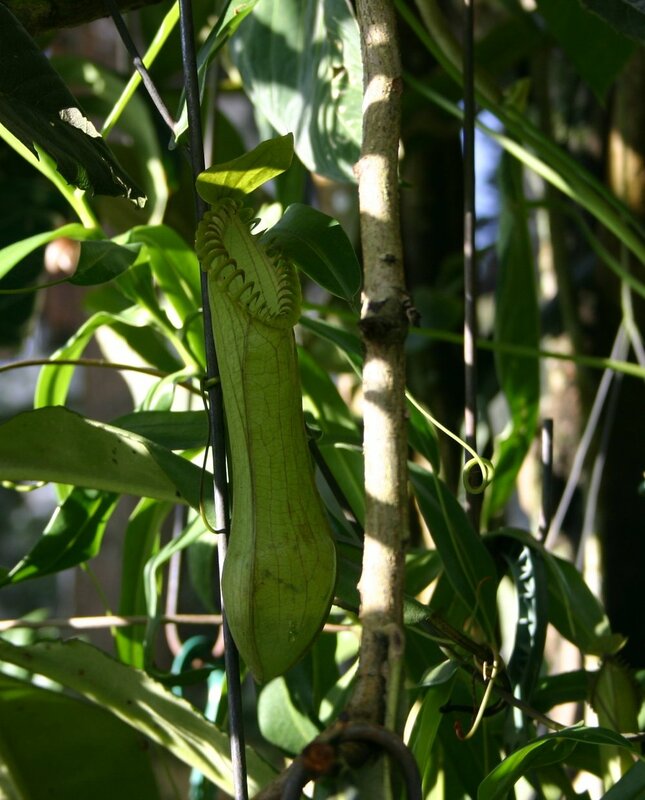 Over the years I experimented with a half dozen or so species of tropical climbers on trellises in the front garden. Early trials were with scarlet passion flower (Passiflora coccinea) which proved too slow under my conditions and was replaced a year later with a Mysore trumpet vine (Thunbergia mysorensis), which proved effortless to grow but whose odd flowers I found vaguely pornographic and whose foliage was far too mundane for my tastes. I also experimented with letting the exotic-looking but sometime invasive calico flowers (Aristolochia elegans) overrun the front wall facing the street but was also dissatisfied with the result. Later experiments included the very striking Philippine blue jade vine (Strongylodon macrobotrys). While no doubt a beautifully-flowered plant species with handsome foliage, it was too rampant a vine to keep under control. In 2007, it was substituted by side-by-side plantings of two New Guinea showy-flowered woody climbers, the red jade vine (Mucuna bennettii) and the New Guinea forest creeper (Tecomanthe dendrophila). The vines were subsequently managed with the red jade vine trained on light cables as overhead canopy and the New Guinea creeper trained horizontally along the top of the wall. The slower growth of these two very attractive flowering vines under cool tropical conditions and their responsiveness to pruning made them a good match for one of the front walls leading from the carport. While both can be a bit of a nuisance under lowland tropical conditions because of their ultimate size and speed of growth, they were very well-behaved at this location. 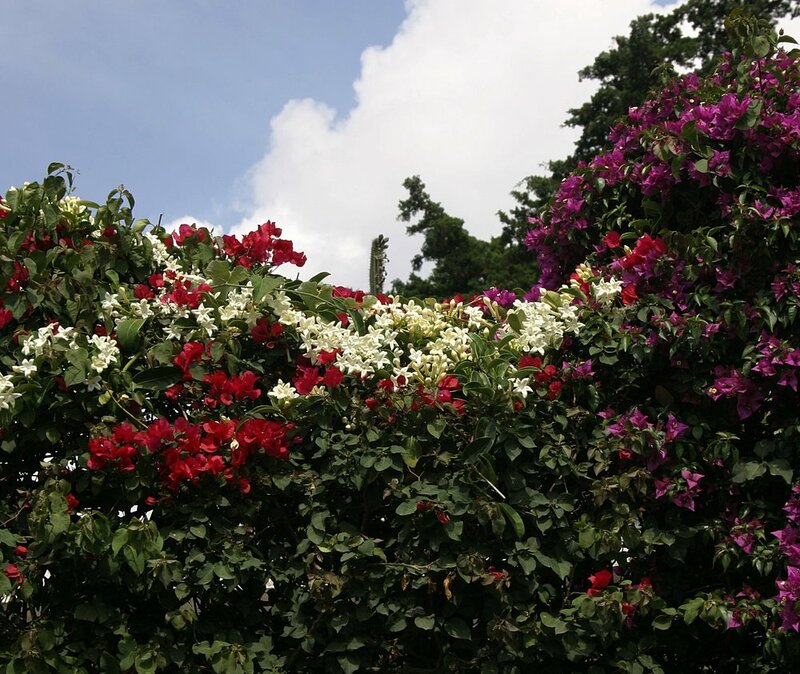 The front garden was flanked by two fairly old bougainvilleas (Bougainvillea hybrids) that appeared to be contemporary with the house’s construction; one with purple bracts and one with deep red bracts. Over the years I pruned these constantly on the upper terrace to form a visual screen to the street. In 2004, I planted variegated Madagascan jasmine (Stephanotis floribunda f. albovariegata) at the base of a wooden pole on the edge of the carport, which resulted in a very interesting and attractive visual “break” between the complimentary bougainvillea colors when it flowered. My neighbors loved them. As anyone who owns bougs is well aware, they always look their best when planted on a neighbor’s property. Option B is to have a gardener on call to constantly clean up the messy, ever present drifts of spent and fallen bracts. I had planted a well-established cutting of the indigenous Dutchman’s pipe epicactus (Epiphyllum oxypetalum) very early on, at its base of the red boug to use it as a live trellis for the cactus' woody stems. This plant attained massive proportions over the course of the next five years, and by 2000 was putting on spectacular night-time floral displays during May and June every year. Because these mass-blooming events were clearly visible above the wall from the street due to their height, by 2005 it was commonplace to have people park in front of the house at night to photograph the flowers. 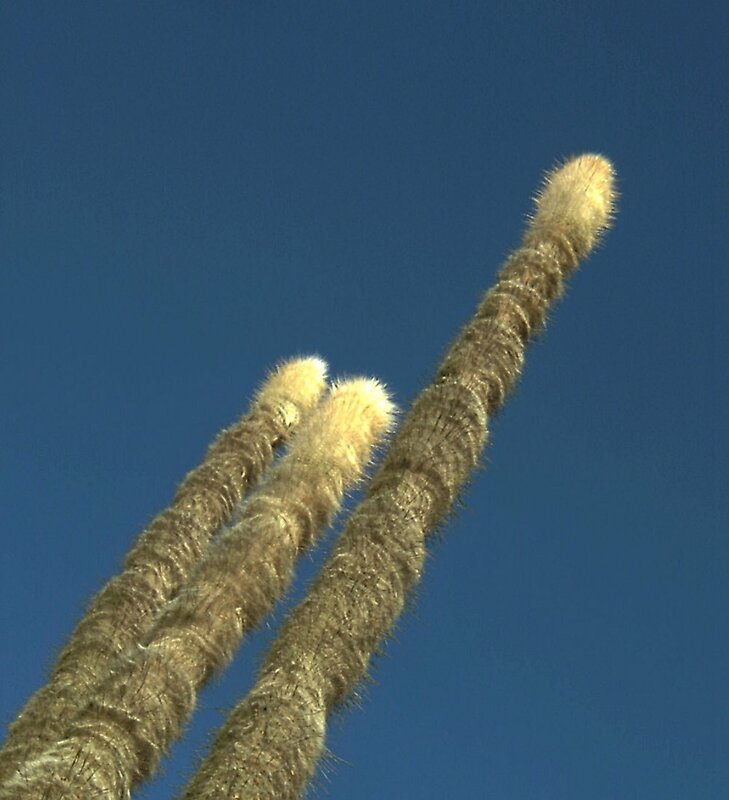 A common epicactus in subtropical and tropical horticulture, it is easily trained to upright form and unsupported terminal stems are strong enough to withstand occasional windstorms without breaking. 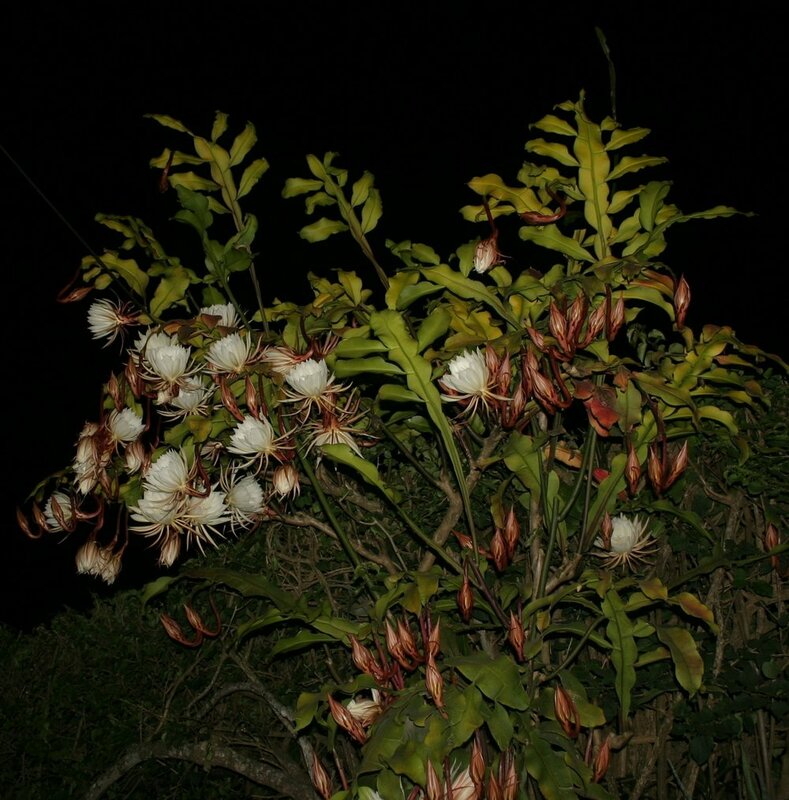 The delicious scent generated by a mass bloom is powerful and intoxicating at night. Other Central American and Caribbean epicacti were grown in the rear garden and grew to immense sizes over the years. The most beautiful flowers among the group that I grew, in my opinion, were the Costa Rican dry forest Selenicereus wercklei (not shown), the spiny Oaxacan dry forest S. vagans and a particularly showy-flowered west Panamanian cloud forest ecotype of E. thomasianum/macropterum. All the larger-flowered epicacti tolerant of cool temperatures deserve wider use in subtropical gardens. What was originally designed to be an indoor patio and wash room was lightly renovated and converted to a ventilated indoor atrium in 1996. This 16' L x 9’ W x 10’ H/5.0 m x 2.90 m x 3.00 m roofed with translucent fiberglass roofing panels and 10% white horticultural screen to reduce sunlight to acceptable levels for species cattleya and laelia orchids. Lower areas in the atrium were used for shade tolerant species of plants. 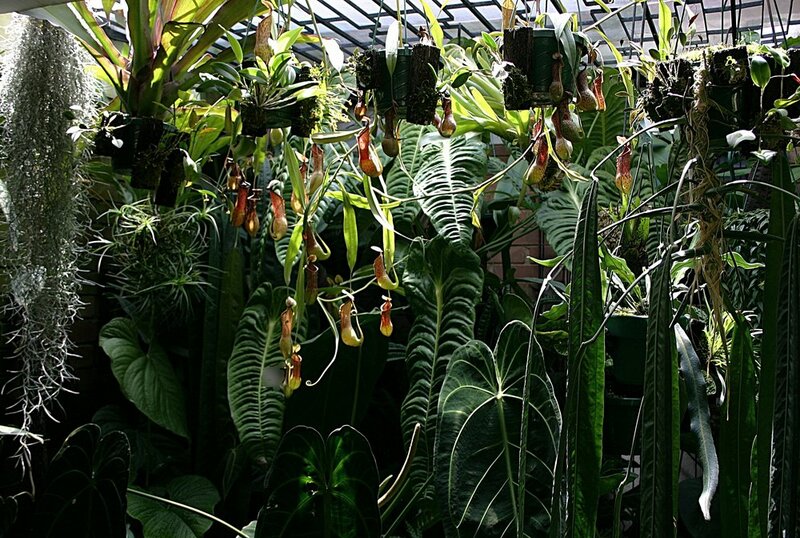 As the collection grew, the shade provided by fairly large hanging plants near the roof permitted deep shade plants to be grown successfully on benches. In 2000, I also began to slowly assemble a collection of rare or uncommonly-cultivated dwarf Central American palms, mostly Chamaedorea and Geonoma species from regional cloud forests. By the time I broke up the collection, many of these species had reproduced in cultivation and several have subsequently gone on to produce second generation cultivated plants. This was, at its peak, probably the most species diverse collection of rare chamaedorea palms in the world, including several that were not cultivated elsewhere at the time (e.g. C. guntheriana, C. pachecoana, C. lehmanii). My interest in collecting the species of African and Arab-Yemeni desert roses (Adenium spp.) began in 2005, and quickly expanded into some of the more compelling hybrids made by famed Arizona plantsman Mark Dimmit and others. I started producing a series of my own hybrids and by 2009 had found that, under local conditions, small blooming plants could be produced in as little as 14 months from seed. 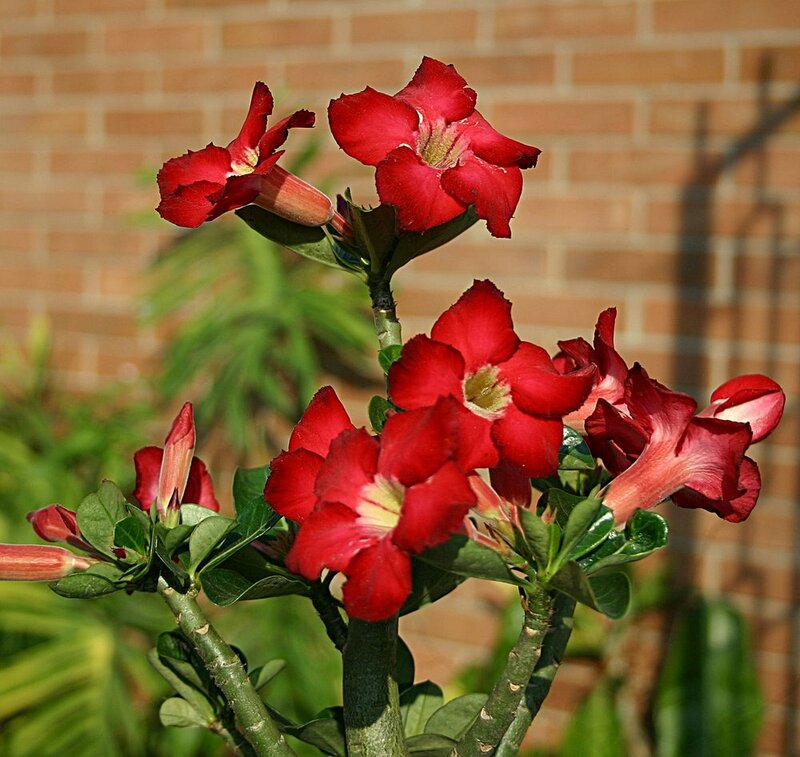 The adenium collection was swiftly followed by a dozen species of seed-grown Pachypodium species, as well as associated stem succulents from Somalia and Socotra Island, Yemen. There were five major weather and volcanic events that affected the garden during the time I lived in this house. In 2008, Hurricane Mitch, the second most disruptive and deadly Atlantic hurricane on record, devastated northern Central America for more than a week and stalled for several days over western Honduras, El Salvador and eastern Guatemala. Wind and rainfall were proportionate with this storm’s force (Category 5 at peak). No fun. In 2001, the first of two cyclonic, cumulonimbus-related storm events struck glancing blows on the property and surroundings, breaking branches and dumping almost 2”/5 cm of hail on both occasions. The second was in May 2003. Cleanup and damage to ornamental foliage on both occasions was very disheartening. Most aroids and succulents looked like they had been ravaged by a weed-whacker. Many large bromeliads were blown off rear garden benches and into the ravine, requiring a complicated retrieval effort. No fun, Parts II and III. In October 2005, Hurricane Stan dumped massive amounts of rain on central Guatemala for several days, triggering widespread landslides and loss of life. No fun, Part IV. On May 27, 2010, Volcan Pacaya disgorged huge volumes of ash and debris, covering Guatemala City and surroundings with significant volumes of coarse cinder. The eruption continued for several more days, but mostly dropped far smaller amounts of dust and scoria than during the initial explosion. 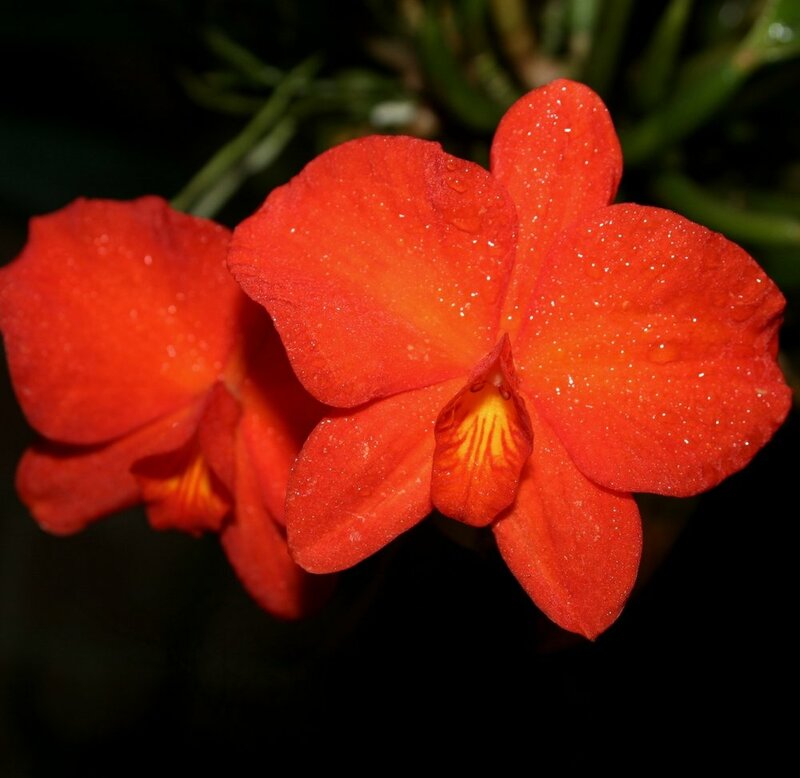 Because the eruption was accompanied by light mist and fog, high sulphur dioxide levels triggered acid rain events, killing many exposed miniature orchids outright and severely damaging the foliage of other delicate plants. The eruption was followed by a well-telegraphed tropical depression two weeks later that was to bring torrential rainfall for a week, and that had me scrambling for days to shovel and lower several tons of soaked black sand from my decorative adobe roof by rope due to fear that it would be compromised and collapse. Memories of long hours spent schlepping 50 lb/23 kg buckets of wet sand around the pitch of my roof in the rain while nervously eyeing oncoming electrical storms haunt me to this day. NO FUN, Part V.
The point of mentioning all the above is that a well-planned garden anywhere can often survive catastrophic environmental events and – while you may be tempted to yield to throw in the towel amidst the wreckage in the the days and weeks after – if cared for, will usually look OK a year later. Occasional outbreaks of caterpillars, were usually met with biocontrol measures, such as Dipel (Btk) for butterfly and moth larval control. 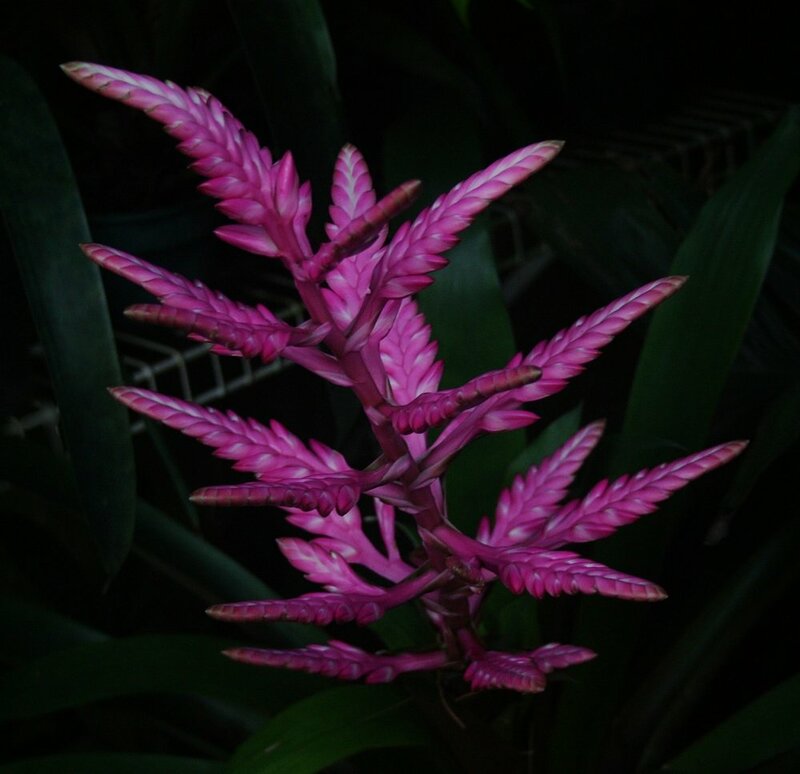 Summit (Bti) was used for mosquito control in tank bromeliads during the rainy season (this is both malarial and dengue country), as well as spot sprays of several commonly available chemical pesticides on severely-infested plants to minimize impact on local wildlife. Enstar II always proved a useful bio-rational arthropod pest control product to have on hand. Snail and slug baits were always placed WELL out of reach of pets and wildlife, in plastic baiting stations to minimize risk of accidental dispersion. I relied heavily on Banrot 40WP as staple preventive drench for succulents applied at six-week intervals during the rainy season, as well as foliar fungicides and the agricultural antibiotic Agrimycin as indicated. Several excellent growing media are readily available and inexpensive in Guatemala. Conifer bark that has been processed, partially-composted and size-graded is accessed from local Caribbean pine (Pinus caribea) plantations, shredded tree fern fiber (several genera) from managed forestry in the Verapaz departments, wild-harvested oak leaf mold (Quercus spp.) from woodlands in the central highlands and surface-mined, high-grade pumice from local subsurface veins. Charcoal suitable for horticulture is produced locally from wild oaks, and while not a sustainable resource is mostly of excellent quality. For succulents, my preferred mix was two parts pumice to one part steam-treated leaf mold, amended with small amounts of dolomitic limestone and slow release, balanced fertilizer. My objective was to end up with a mix that would not flood out of a pot if watered full force with a breaker-equipped hose, since we occasionally had very large amounts of rain fall in very short time spans. For mounted orchids and bromeliads, the preferred materials were virgin cork and tree fern plaques. 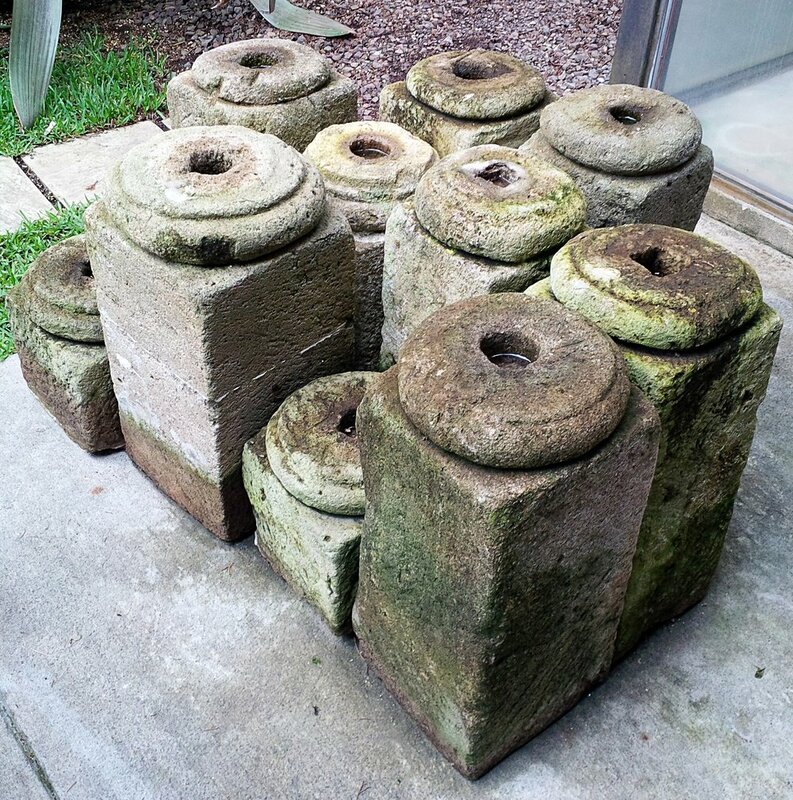 For palms and cycads my base mix consisted of one part pumice to one part oak leaf mold, more heavily “salted” with powdered dolomitic limestone and time-release fertilizer than my standard succulent blend. For potted orchids I generally used a combination of medium grade, previously soaked conifer bark, charcoal and suitably -sized pieces of lava. Alternately, for some species, pure shredded fine grade tree fern fiber or mixed 1:1 with medium grade charcoal or NZ sphagnum moss, depending on the species. 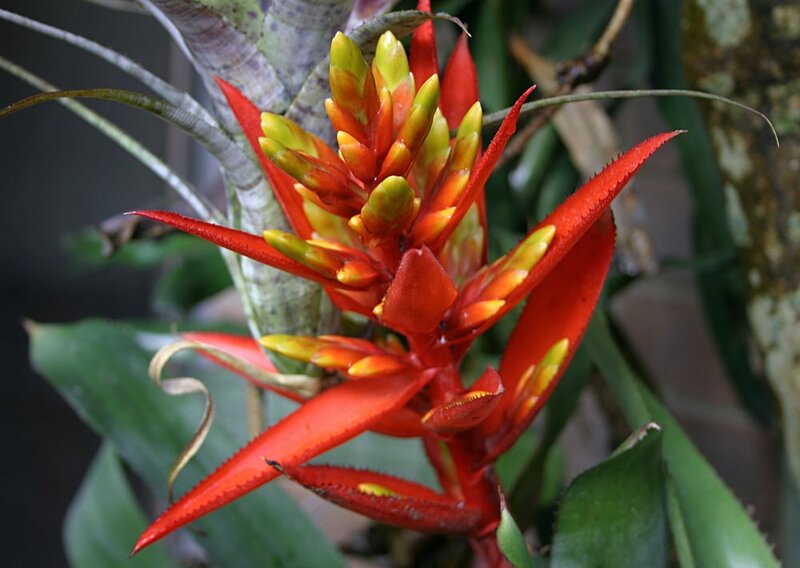 These blends were also suitable for many bromeliads. For tropical pitcher plants I favor equal parts fine conifer bark, medium grade pumice, fine horticultural grade charcoal and a handful of oak leaf mold for a long-wearing substrate suitable for robust species. Seedlings and epiphytes were generally grown in pure live sphagnum. For tropical aroids a blend of equal parts fine to medium grade bark, plus fine grade shredded tree fern fiber and charcoal was my mainstay mix for over 15 years. Seedlings, cuttings and imported starts were potted in pure NZ sphagnum until well-established. One of the lessons that I learned here early on with pot culture outdoors for almost all plants in the wet tropics is the need for a durable growing medium with very sharp drainage. Since these characteristics typically imply a substrate with low native fertility, plants need to be fed more frequently than plants grown in “traditional” media. One exception would be the use of high quality dry or live sphagnum moss, which retains moisture and nutrients (too) well. This material should be fertilized with a light hand to avoid rapid breakdown. 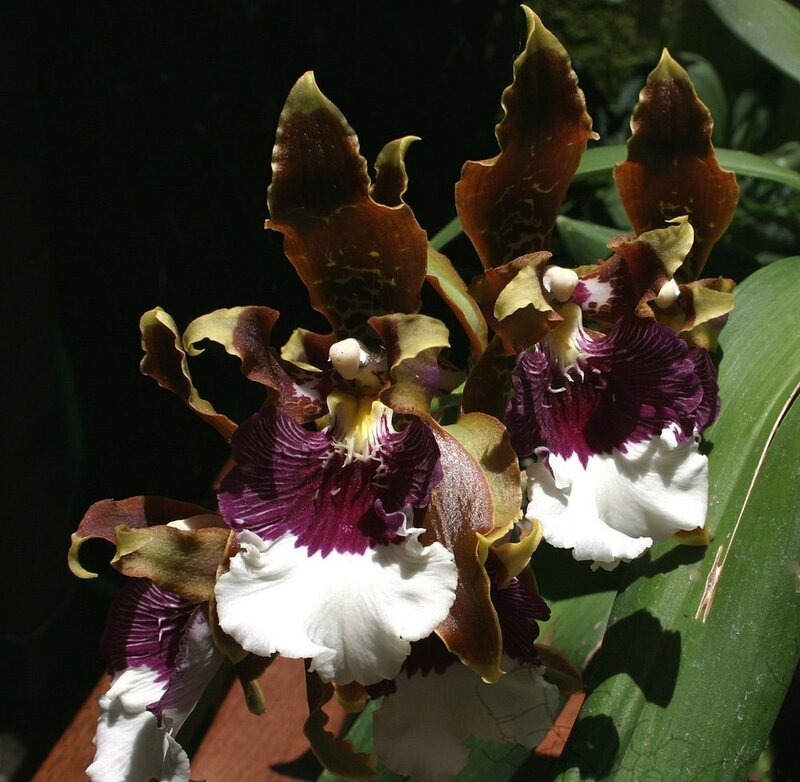 Some SE Asian growers favor charcoal or burnt-earth alone, but these are media more suitable to vandaceous orchids than a diverse collection of plant families. A four stage Reverse Osmosis Deionization (RODI) system was installed in the indoor roofed atrium in 2004 with a theoretical capacity of >250 gl/960 lt of pure water per day with and a recovery rate of about one part RODI water to seven parts runoff/waste water. This resource allowed me to grow a significant number of very delicate plant species, especially miniature cloud forest orchids and palms, that otherwise would have proved challenging to succeed with using available municipal tap water alone (pH 7.5-7.8 and TDS ~400 ppm). So, at the peak, how many plant species and hybrids were there growing at Cusucos? Based on a rough count from my old Guatemala inventories, I would say close to 900 forms. This included many seedlings and miniatures on tables and in the roofed atria, granted, but still that’s a lot of salad. It is quite remarkable as to how many miniature (and not) plants can fit into a small garden when “non-traditional” space is utilized to its fullest. My very intelligent, capable and very efficient housekeeper, Yesica Najar, together with the help provided during a weekly visit by a surprisingly competent gardener, was able to hold this disparate collection of plants together during my wife’s and my frequent travels for almost three years towards the end with negligible losses. The fact that neither she nor the garden blew up in spectacular fashion during this period of protracted absences by the property owners speaks volumes for the strength and good qualities of both. 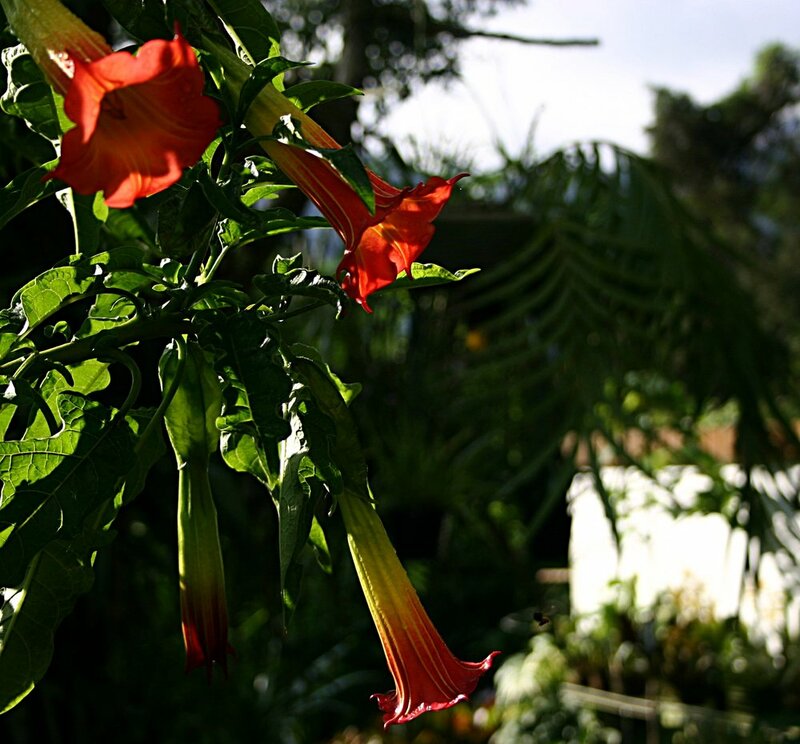 When I left Guatemala, most of my plant collection ultimately ended up divided among several friends. Larger palms, cycads, flowering tropical trees and most of my landscape bromeliads ended up at Finca La Concha, a working farm and private botanical garden located in southwestern Guatemala. 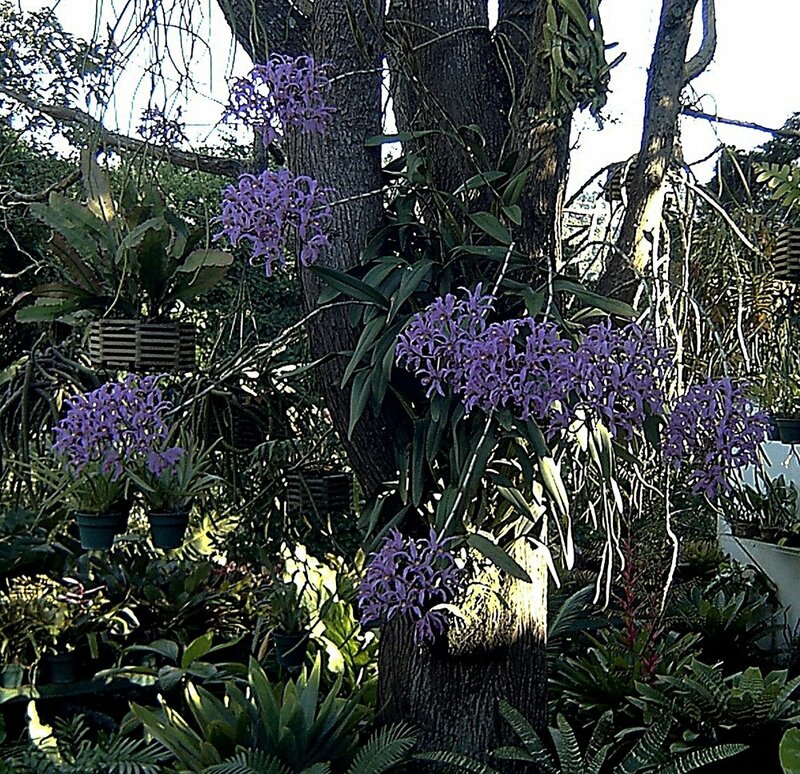 Aroids and other tropical foliage plants such as medinillas, pipers and ferns were left with the Palmieri family, and some can now be seen at their display greenhouses at Orquideas S y M in Guatemala City. My extensive highland tropical pitcher pant collection was left with Peter Rockstroh well before I finally left Guatemala but was subsequently transferred to the care of our mutual friend Juan Jose Castillo when Peter moved to Colombia. Juan Jose also absorbed almost all the chamaedorea palm, cactus and succulent collection, while Luis Molina of Antigua Tropical Gardens ended up with most of the orchids as well as some rare C&S as well. I had made the decision to slowly (and legally) import some effectively irreplaceable plants in my collection that were not CITES listed and did so gradually over a three-year period whenever I traveled back and forth on business. This process required having valid USDA plant import permit in hand, as well as phytosanitary certificates issued by Guatemala’s Ministry of Agriculture for each hand carriage. What was I able to import? Something close to 120 species. How many successfully re-acclimated following the traumatic clean bare-rooting process? About 100. Despite the fact that the move to California represented a major change in my life (to say the least), and that the first years in the San Francisco Bay Area I really did feel like “a stranger in a strange land” after a lifetime abroad, I have come to enjoy having a different palate of plants to work with here, as well as different friends, under somewhat different conditions. So much for the Casa de los Cusucos. Leaving any place where so much thought, money and hard work has been invested is always difficult, but somehow the world keeps turning. In 1942, the famous Anglo-Kenyan aviatrix, explorer and writer Beryl Markham wrote, “I have learned that if you must leave a place that you have lived in and loved and where all your yesteryears are buried deep, leave it any way except a slow way, leave it the fastest you can. Never turn back…”. This seems like sound advice for anyone moving on from any remarkable place, time or relationship. In closing, I offer a series of images taken over the years of some very beautiful bromeliads and orchids in flower from my old garden, in what really was a "Vista Hermosa" in the central Guatemalan highlands. It is worth noting that all of the species shown below were grown outdoors, year-round, with little or no overhead protection provided. And finally there was Zell, the last cusuco, who had to leave early (Q.E.P.D).